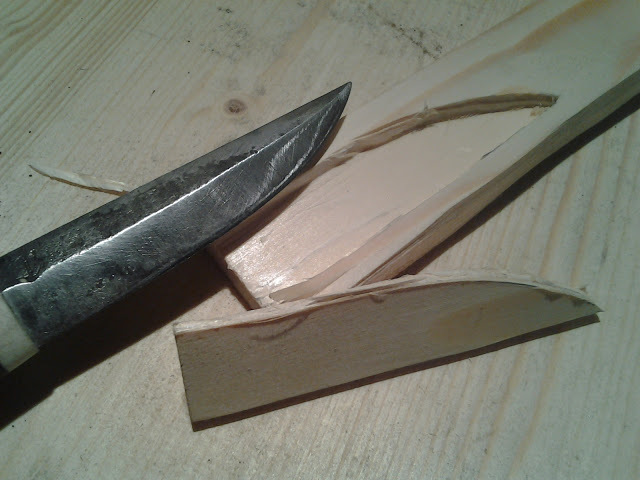 Here is a very interesting piece by Ilkka Seikku about making a puukko without any power tools. I hope he’ll favor us with a sequel on the leather work aspects of this project. Thank you Ilkka! “First I forge the blade. 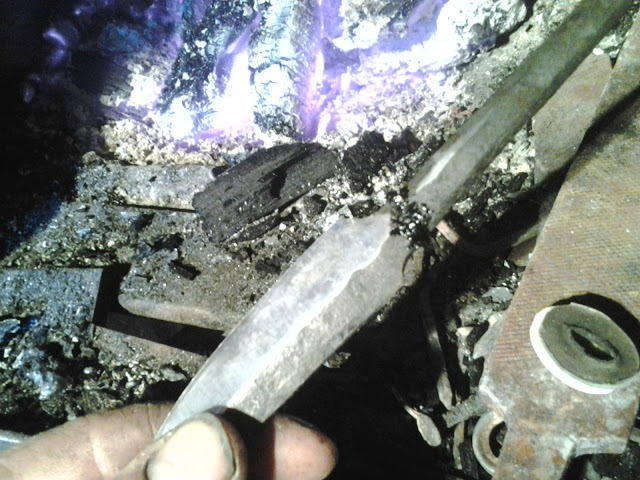 I use my foot powered forge and hammer it from silversteel. 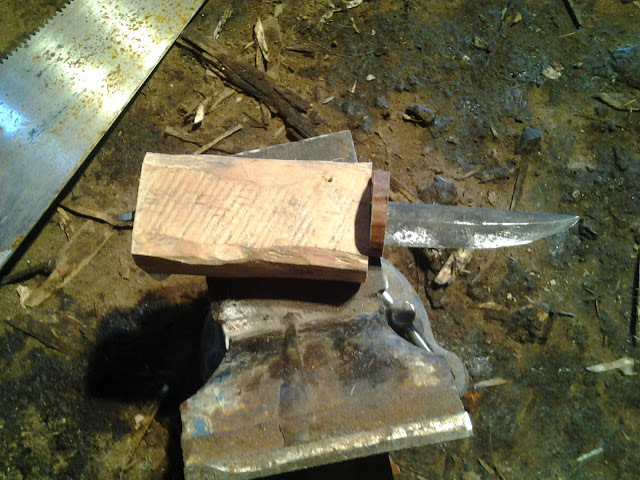 It’s necessary to hammer the blade straight to its shape and even the bevels need to be almost ready after forging. 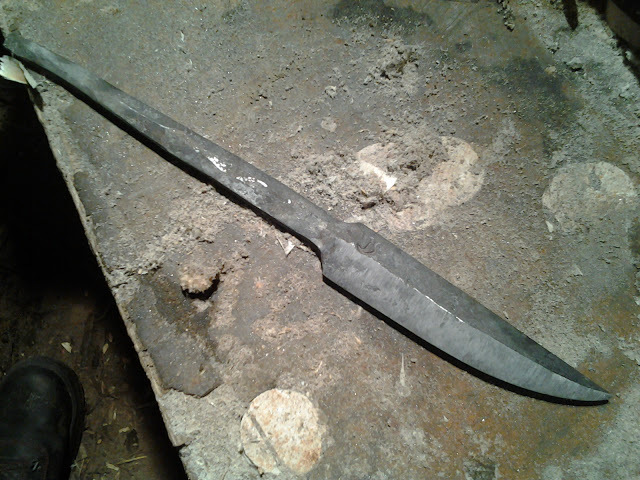 It´s very hard to file the blade if during forging the hammering hasn’t been so good. 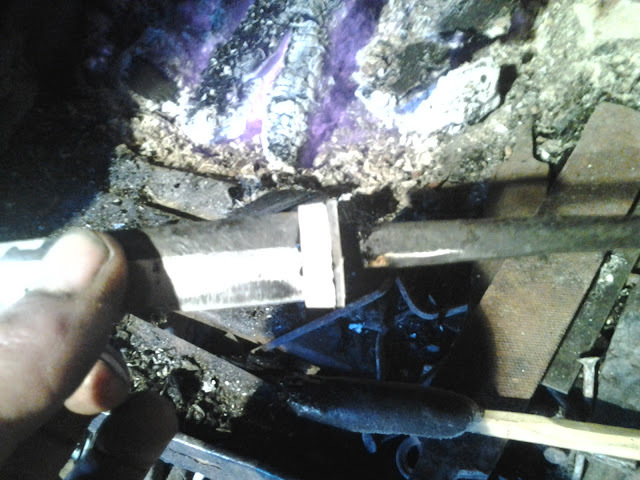 I forge this blade to be something like 90 mm long and 22 mm wide. It has rhombic section and the thickest point is about 5 mm. It´s quite regular and traditional size. 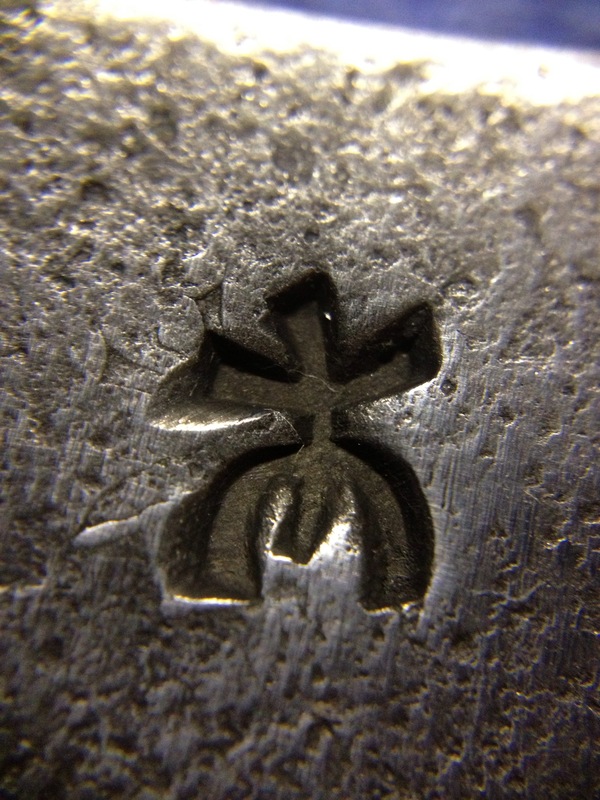 If you’re lucky enough to have seen some old Finnish maasepänpuukkos, you may have seen they have hammer marks on the bevel too. 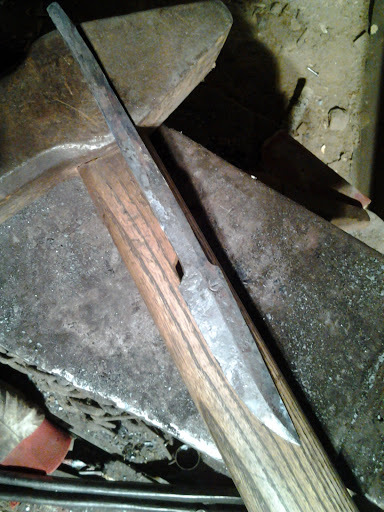 That´s because the forging was done very close to final thickness also for the bevels. 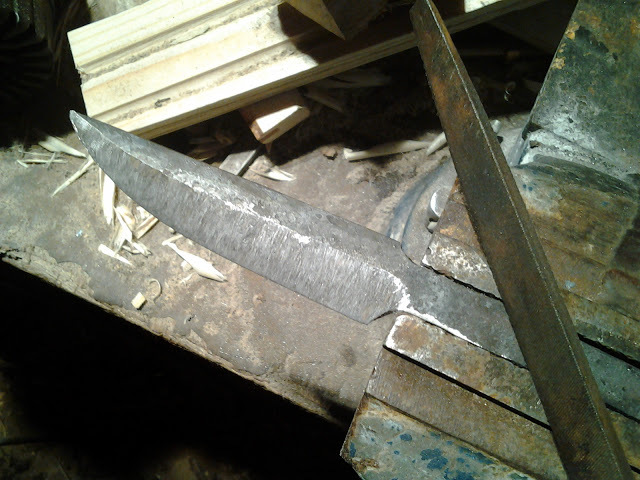 Filing and grinding with hand tools is very arduous so it has to be forged almost sharp. 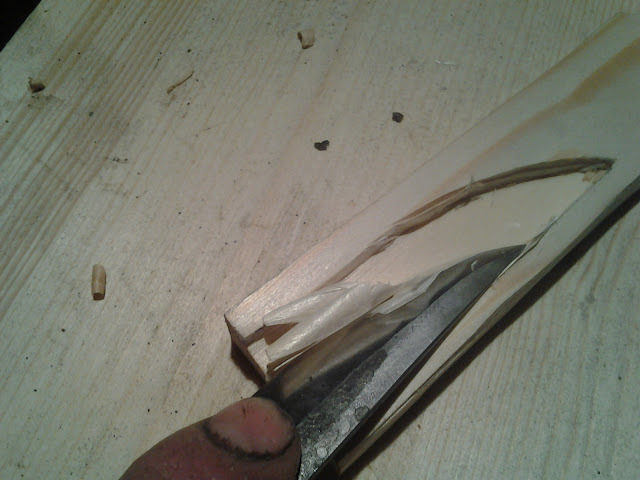 Next thing I do is to file the bevels edge just a little bit so it´ll be fine. There’s no need to do anything for the spine or anything else neither, it was fine already. Now I need a handle. This is a hard part, maybe the hardest one. It’s a lot of work sawing very hard curly birch (diameter over 20 cm) with a hand saw. Finally I got my piece for the handle. 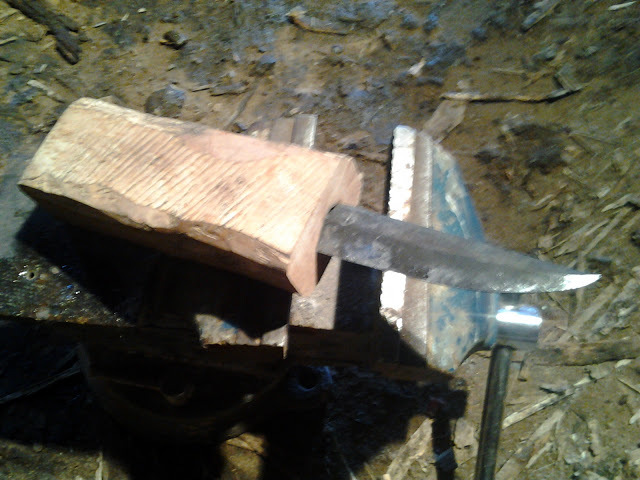 I shape it to be fitted better to the blade with my self made ax. 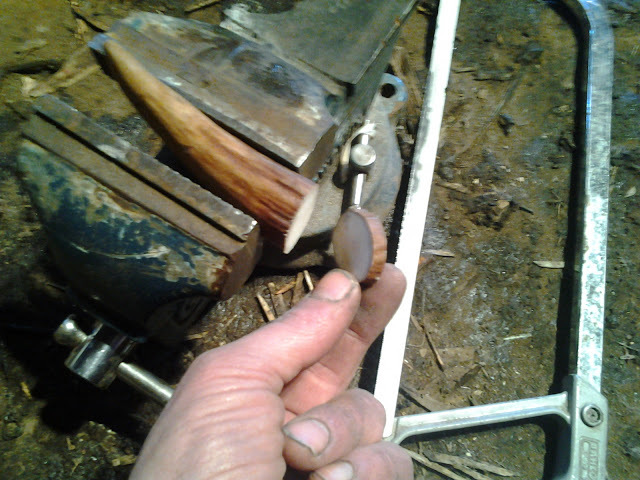 Then I drill a hole with, again self made, hand drill. 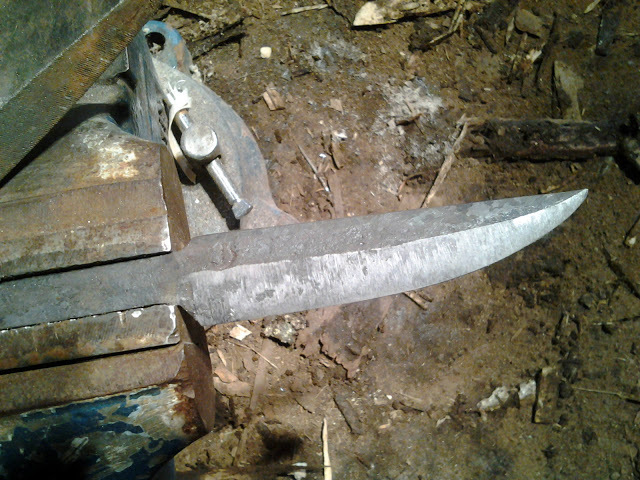 As you may have noticed; I haven’t done any heat treatments to the blade yet. 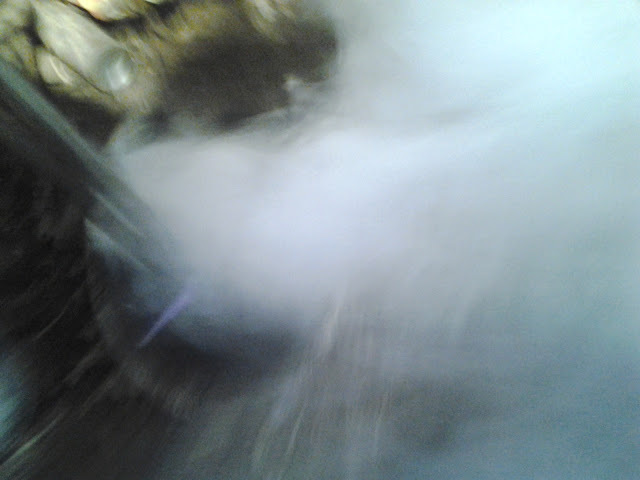 That´s because I´ll next heat the tang to burn the hole. 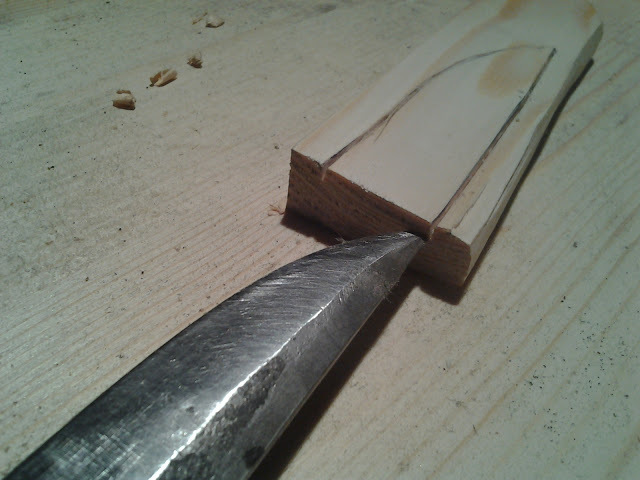 This is how I can make the hole to be exactly in the size of the tang and the blade will stick in the handle “perfectly”. It´s very important NOT to burn it all the way through! The last cm needs to be pushed through when the tang is cold again. This is how the fitting can be made very nicely. Now I saw a piece of antler that will be the bolster. 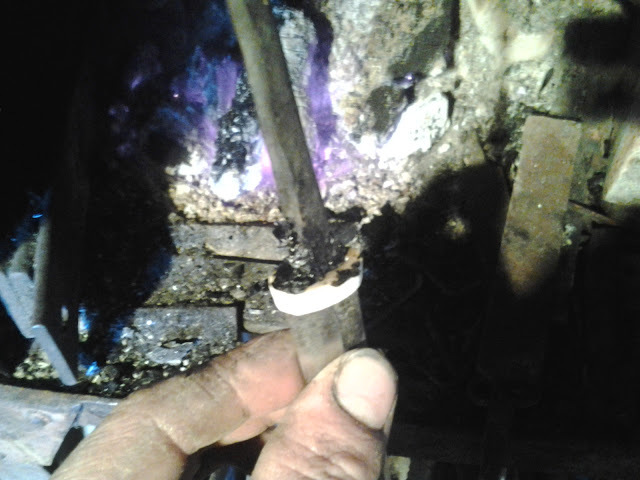 Again with the hand drill, I make a little hole and burn it through with heated tang. 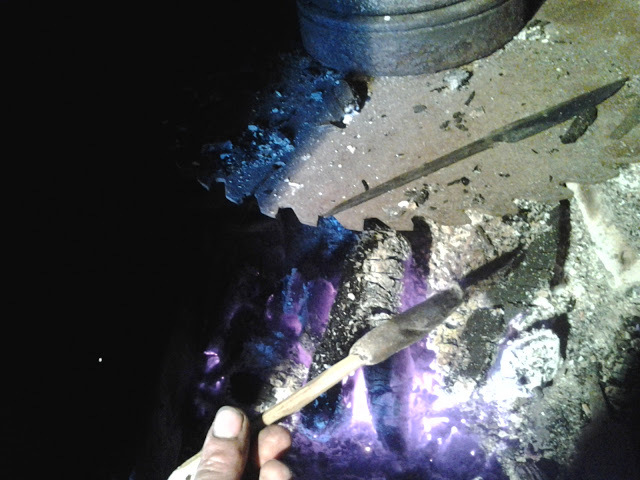 When burning through the antler with tang, it has to be done very quickly, otherwise the antler will burn. 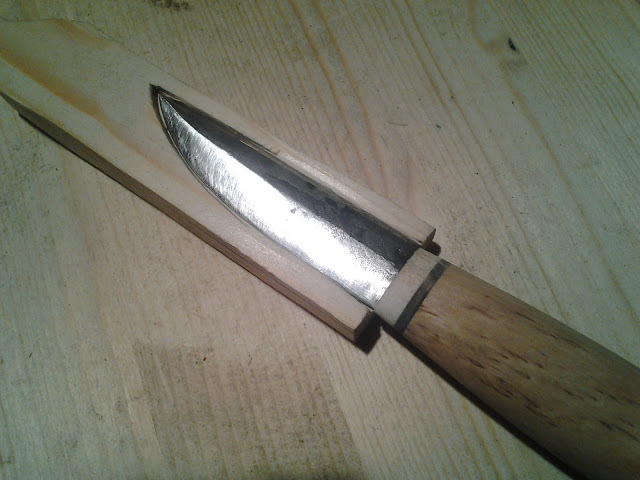 Then I cut the handle so that the tang is longer than the blade, as I´ll rivet the tang from the bottom of the handle. 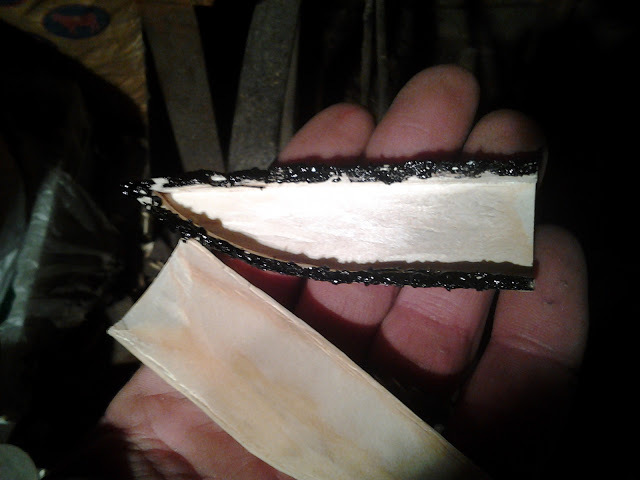 After a little checking I cut a piece of moose rawhide to be a liner between the birch and the antler. I wet the rawhide and hammer it to be very hard. So I make sure that the it will not shrink. 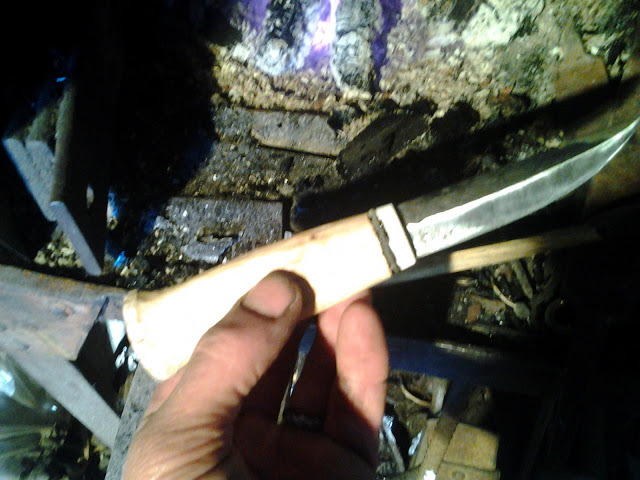 Now that I have fitted the handle around the tang I can make the heat treatments. 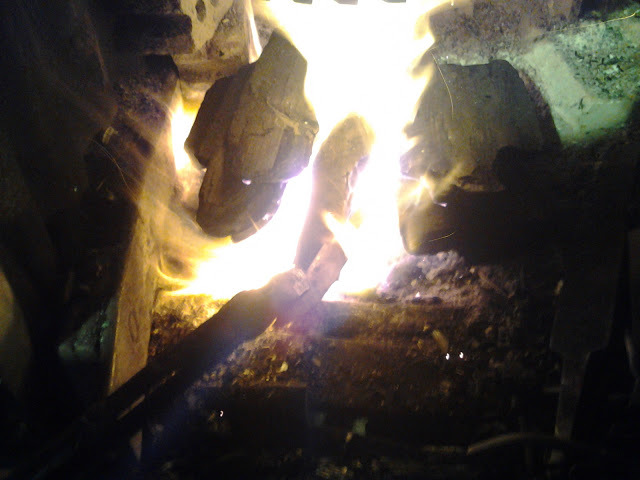 I use always a living fire while making it. That´s the way blacksmiths have done for ages! 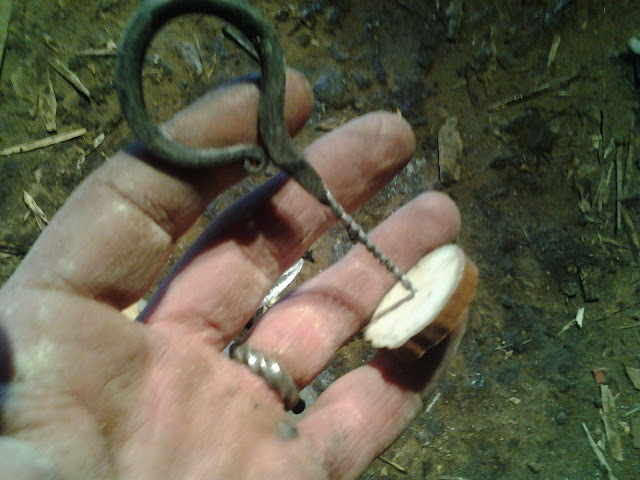 It´s very sad that today many blacksmiths can’t trust their eyes and experience to do that. They use all kind of modern equipments to get exact temperatures etc. 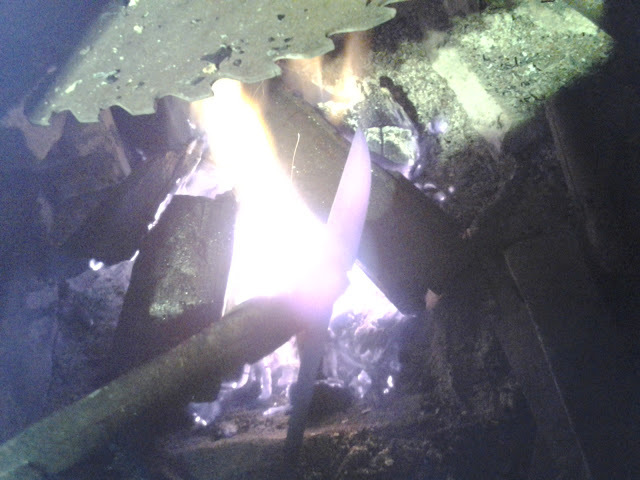 If someone can tell me if some blade was tempered in oven or with the fire just by using the knife, I surely dont´t believe him! 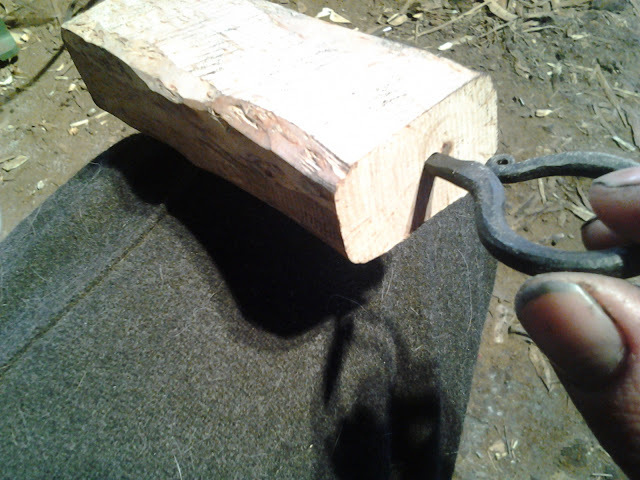 I whittle the shape of the handle with my self made BushProwler and then sand it with 80# sand paper. 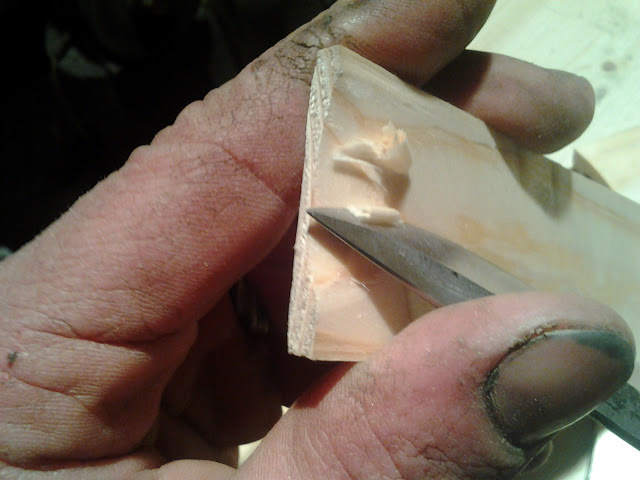 After the piece of birch starts to get some shapes it´s time to glue the knife together. First I glue the bolster to the tang. 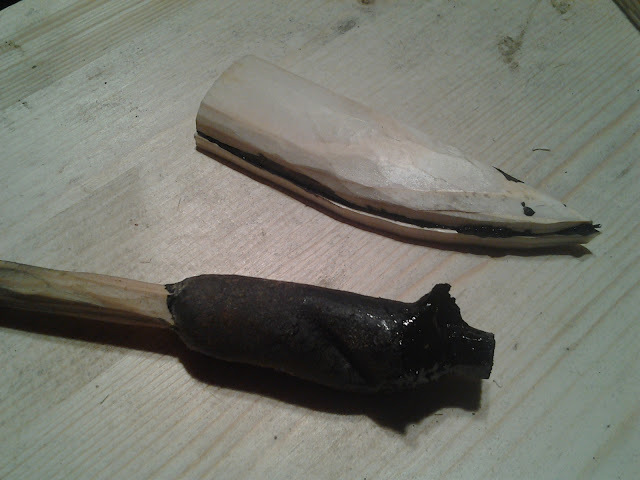 I use, guess what, my self made glue that I get from mixing birch bark oil and carbon black. 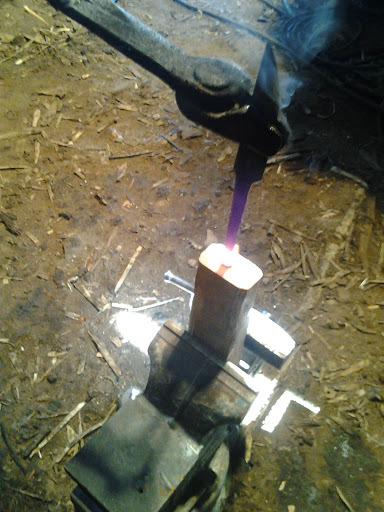 It works like heat glue, so I have to warm up the tang, but not so much to spoil the heat treatment. I managed to find a quite good mixture, the glue needs high temperature to melt and is not too glass-like after getting colder. Right after gluing I hammer the head of the tang so to rivet the all knife. 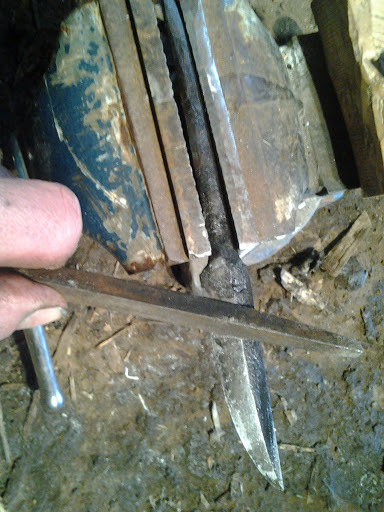 I hammer the head of the tang so to rivet the all knife. After some more whittling and some finishing with 80# sand paper, I took this picture. This is about all of the tools and materials I have used. 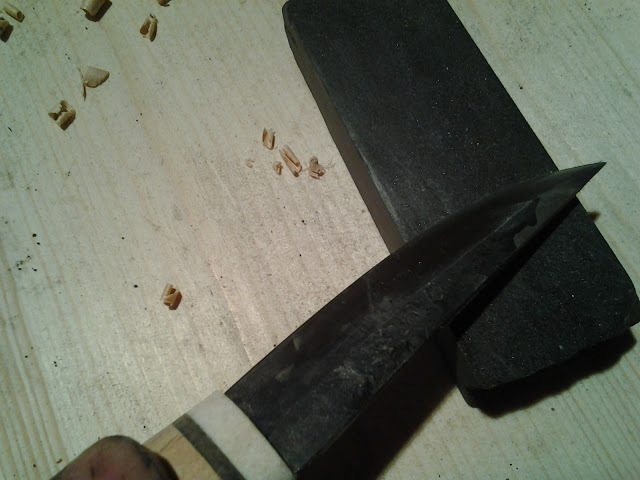 Now some sharpening with a piece of slate I have taken from the wilderness. There is a lot of slate in our forest and I have found it to be very good grind stone. 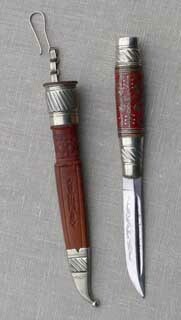 Traditionally made Finnish puukko. This is something I can proudly say to be HAND MADE! 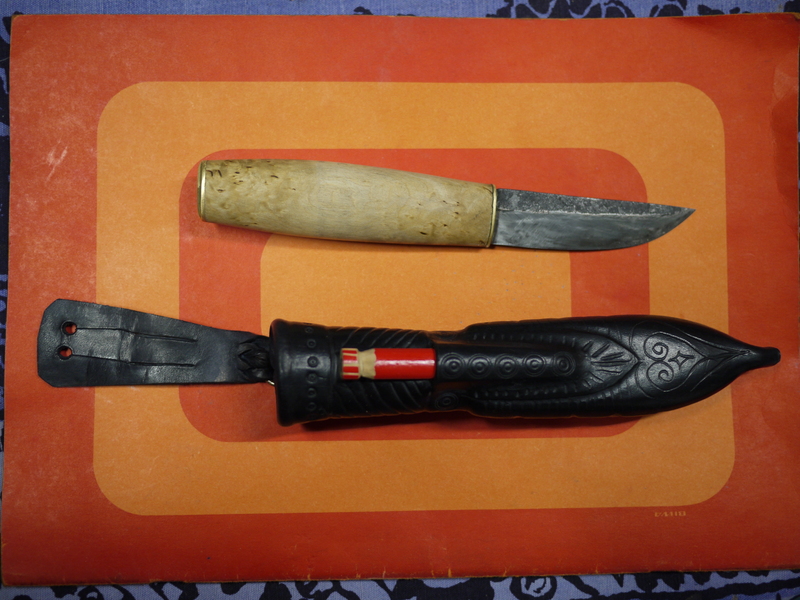 Now it´s time to check if this puukko is worth anything. 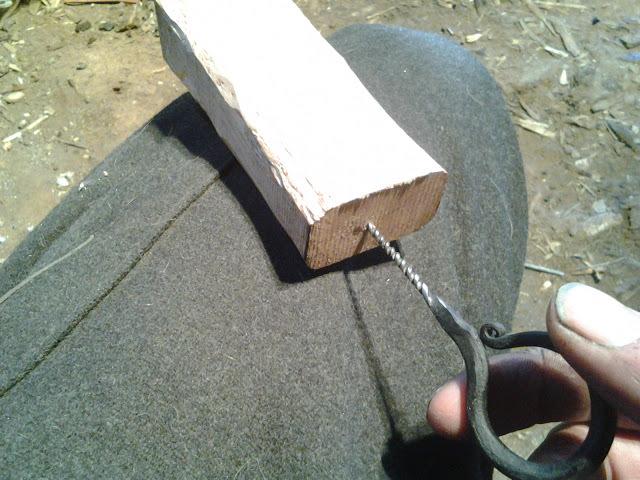 A puukko needs a sheath of course, and its first job is always to carve its own wooden liner! 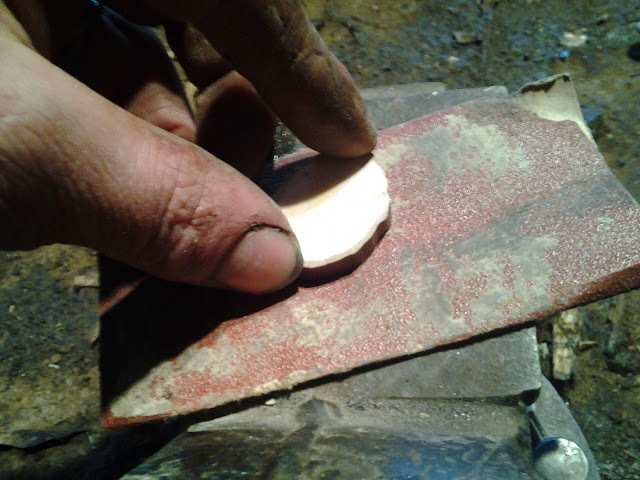 I use coniferous woods when making inserts. It has great ability to remove the moisture from the blade and fade it avoiding any damage for the blade. Making a liner is very easy. First the blade profile is drawn and then it’s just carved off. 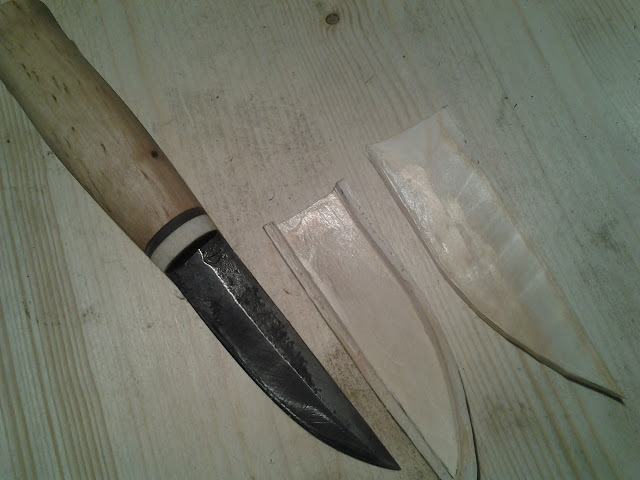 From these pictures you can see that there is really no need of chisels or anything else but the puukko that is going to have this liner! 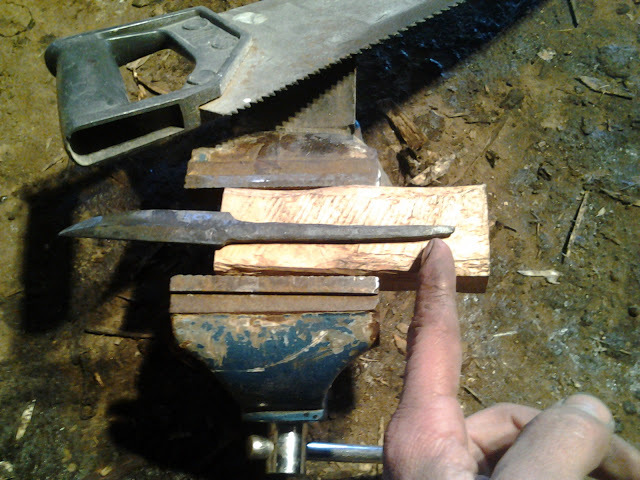 This insert must be solid, so it needs another piece of wood at its back. I usually use birch for this piece. It’s quite hard wood and it makes the all liner more solid. When the top is, for example, spruce, the moisture can still fade away easily. Again the gluing is done with that same glue as I used for the handle. After the glue gets colder, I can shape the insert to be ready. 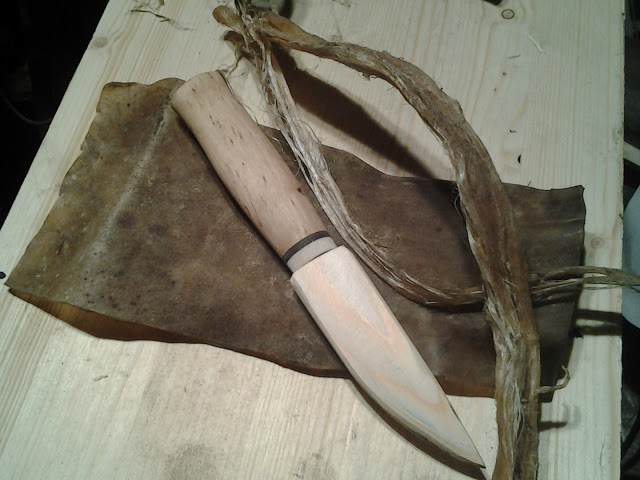 I cut a piece of moose rawhide, which I´ll use to make the sheath and also there is a moose leg sinew which I´ll use for the sewing. First I have to bark tan the leather but that´s another story. Maybe I´ll share it with you someday. It was one year ago yesterday that I made the first post on this blog. 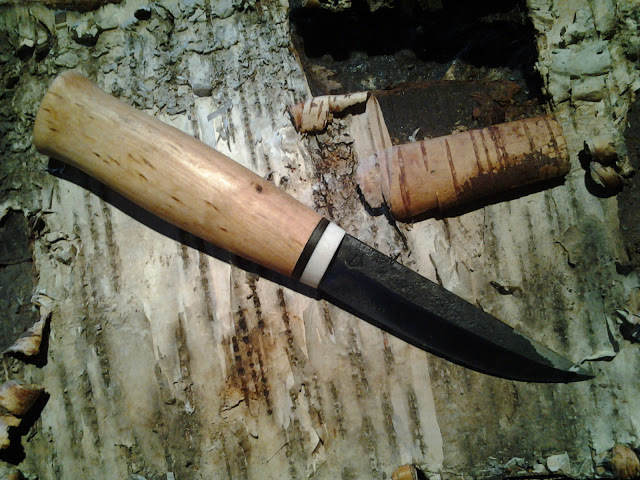 It featured a black ebonite handled puukko by Joonas Kallioniemi. 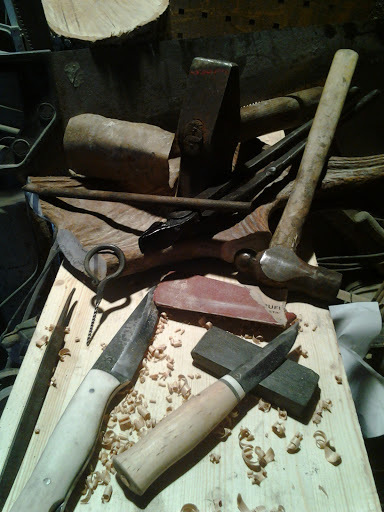 In the past year I have posted frequently and learned a lot about the puukko and the culture of Finland thanks to the many generous puukkoseppä who have taken the time to write down their thoughts, share their knowledge and send photos of their work. Federico Buldrini was especially helpful during the past year, supplying information and photos for many posts. I look forward to learning more from the friends I have made during the past year and to posting more of their work. If anyone has anything they would like to share or anything they would like to see a post about please leave a comment and I’ll contact you. I would be glad for any suggestions or requests. 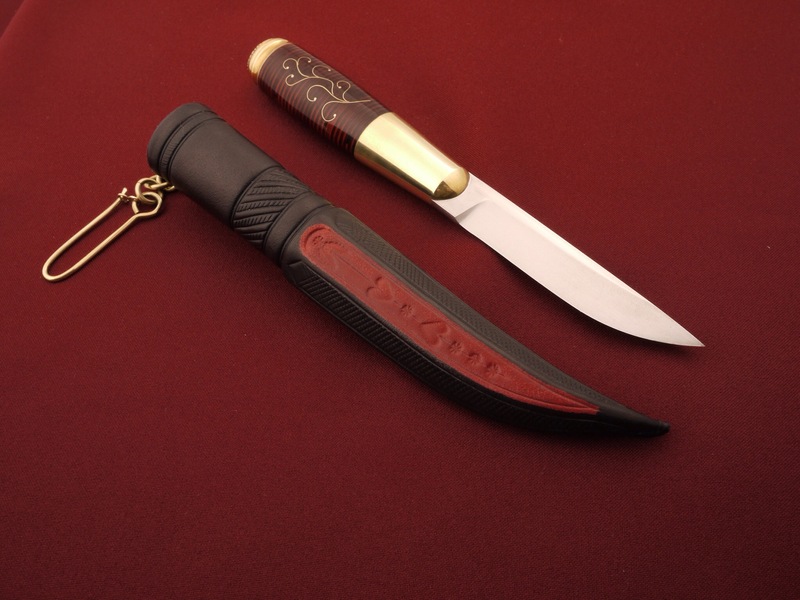 I would like to share another ebonite handled puukko from Joonas Kallioniemi today and also to post a list of the countries that the viewers of this blog originate from, 97 countries in all. I would like to show the contributors to this blog how popular their work is. 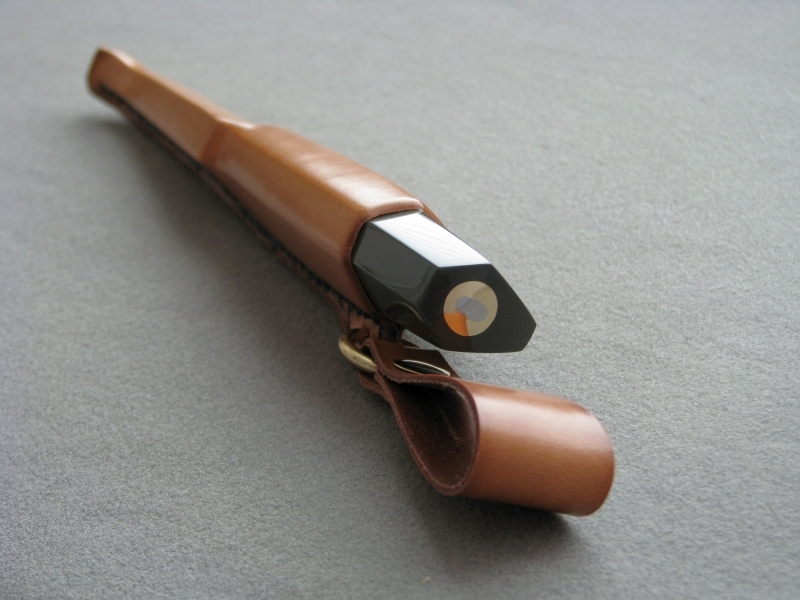 I never thought there was so much interest in the puukko when I made the first post one year ago! 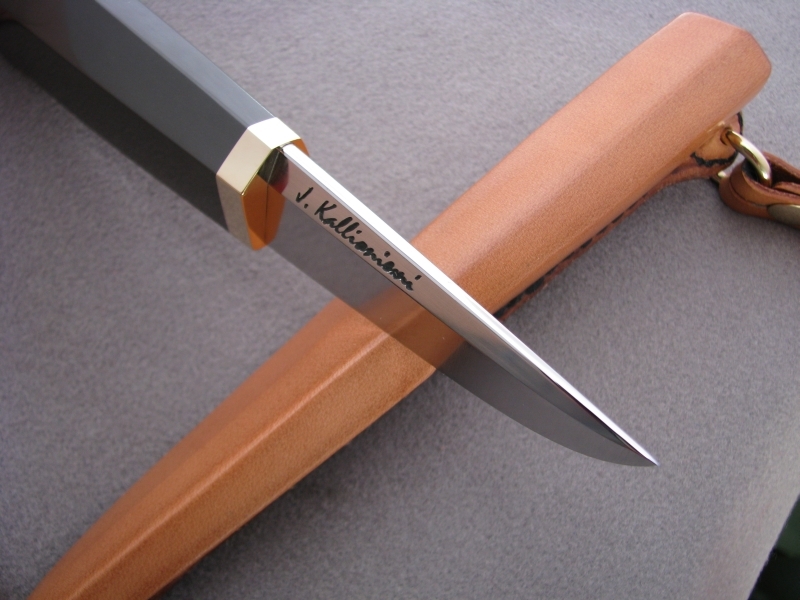 “Kustaa Lammi (1901 – 2001), son of the old master of Finnish knife making Juho Lammi, started making knives at a early age. When he was only 10 years old, he sold his first knife at the Kauhava railway station. Since then he was in the knife making business. 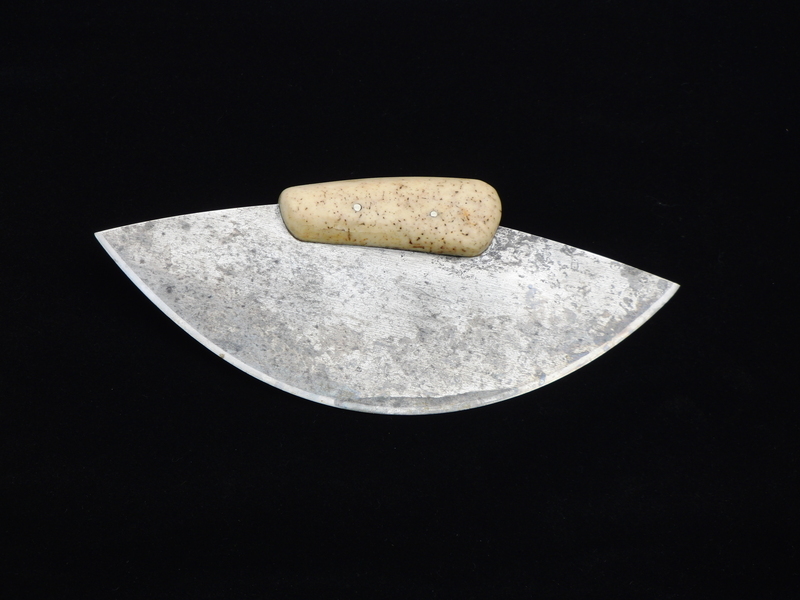 Kustaa Lammi made his last knife at the age of 95. Starting in 1921 Kustaa Lammi ran the knife making business which his father started in the Kettula, part of Kauhava. The products of Lammi’s knife factory have been exported to over 15 countries, including Australia and the United States. 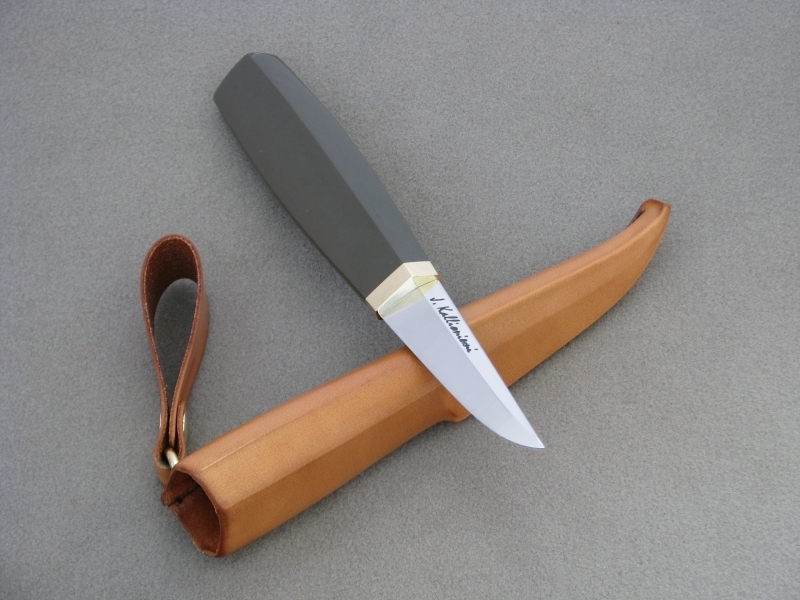 The shape of the puukko has remained the same as the original Lammi’s puukko. 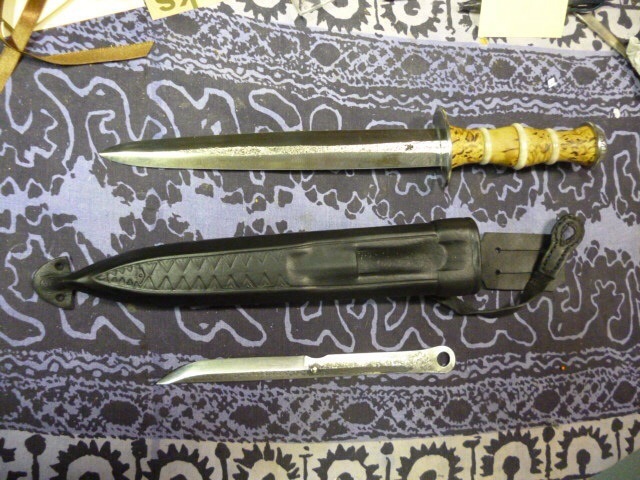 It takes time to make hand make a puukko. Kustaa appreciated the traditional working methods and continued using them. 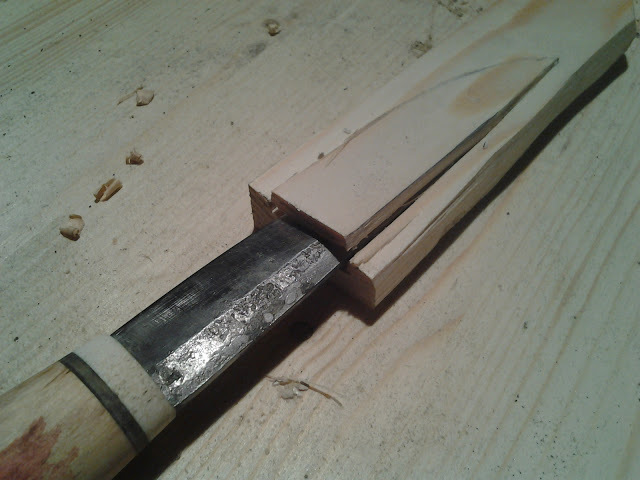 Kustaa said that it takes about a week to make a puukko. This is the second part of Theo Eichorn’s story. 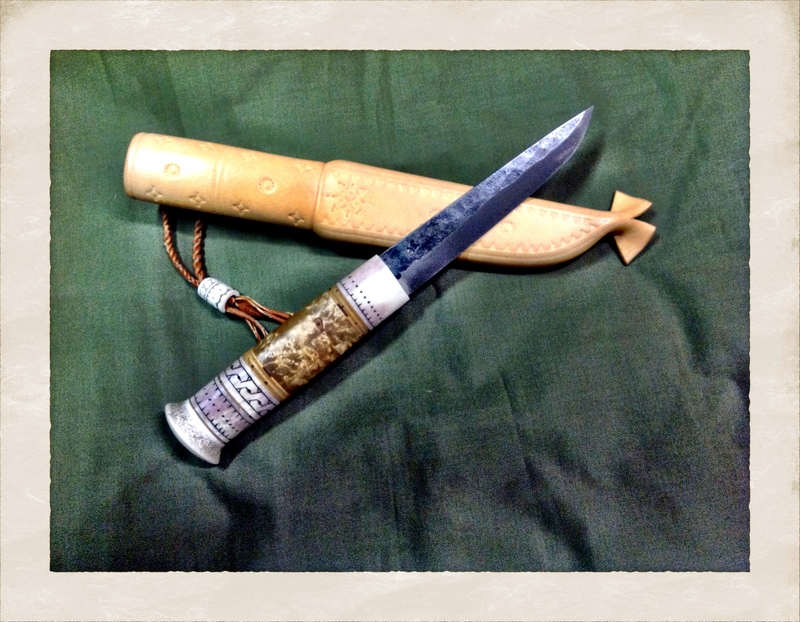 It’s his account of how he found his way to Finland to immerse himself in puukko culture and learn as much as he could during a three year stay. It’s a remarkable voyage and I thank Theo for sharing it with us! “My first trip to Finland came in the late spring of 1982. I was here for about three weeks, half the time in Helsinki and the other in my uncles cabin on a little island on Kivijarvi, part of the Saimaa lake system in South East Finland. Although I didn’t realize it at the time, this trip was to have a major influence on my life, as it was at this point that I began thinking about living a rural and simple life style. 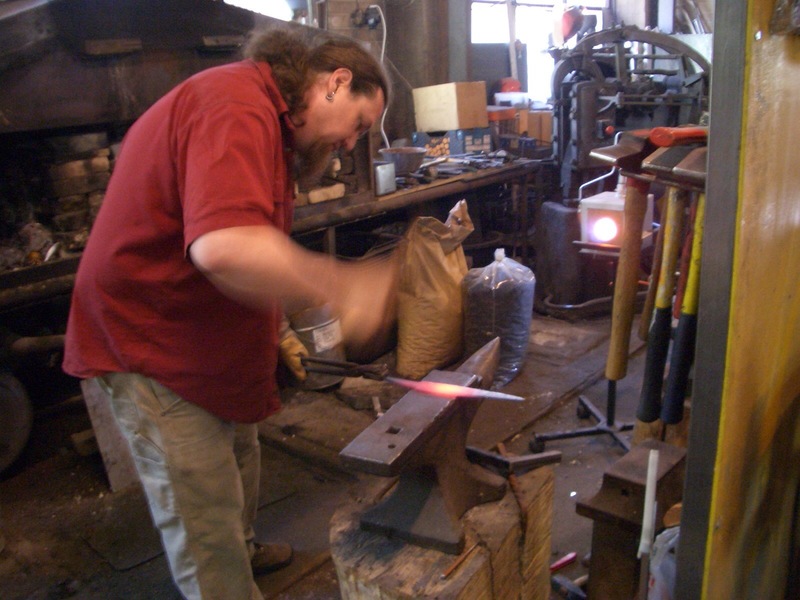 By the mid nineties I had put together my own shop at my parent’s house, learned the basics of forging and was becoming more active in knife making. 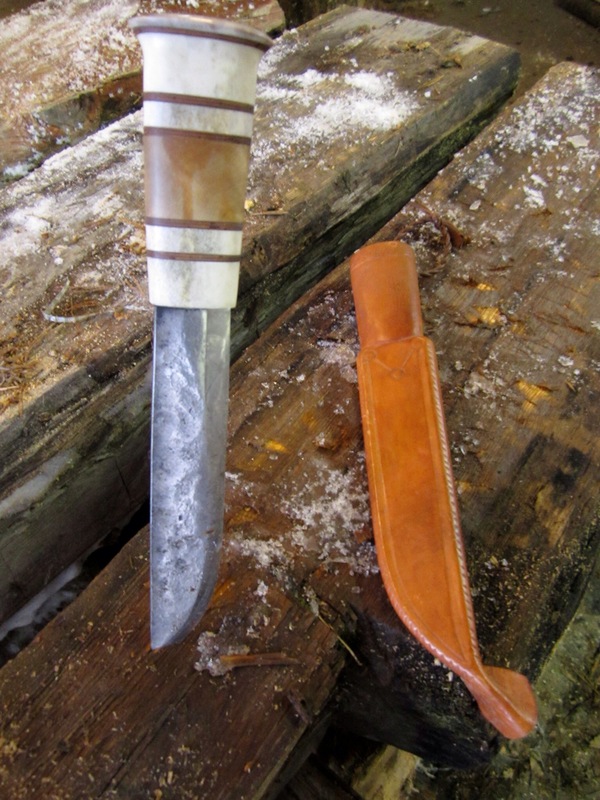 I had always been influenced by puukko and Scandinavian knives, and began to wonder if there was some way to come to Finland and learn about puukko in the land of their birth. But it wasn’t until 2006 that I was able to make it back. In 2006 I made my second trip to Finland. 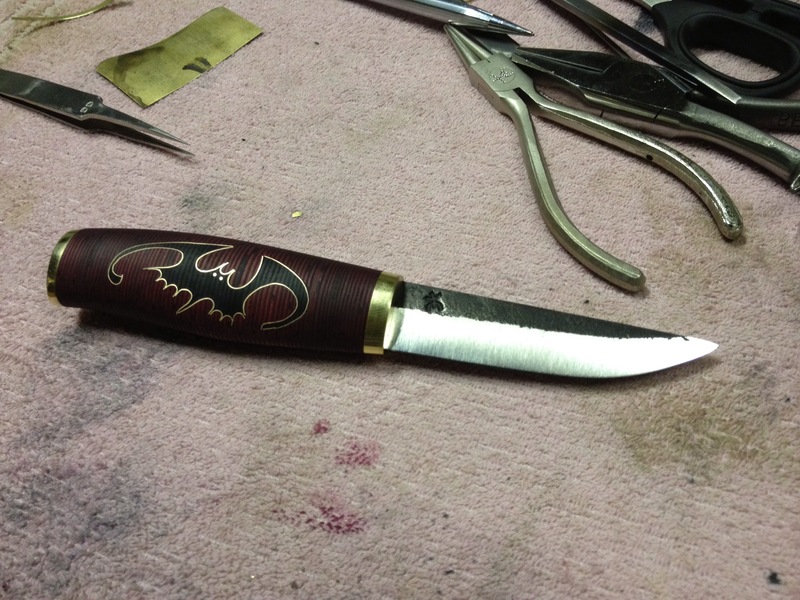 By this time I had been making knives in my own shop for about ten years, had taught myself much about knife making and learning as much as I could from the various publications and other knife makers. 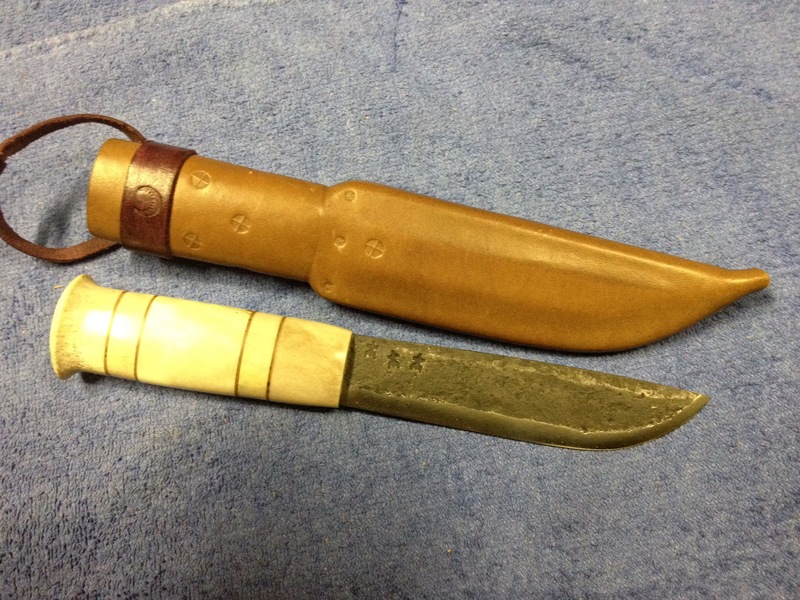 By this time I was working at William Henry knives, which provided me with the income to be able to do some traveling. As luck would have it, the Fiskars Puukko Festival coincided with my trip, and I was able to see my first real show of puukko’s. It was fantastic! 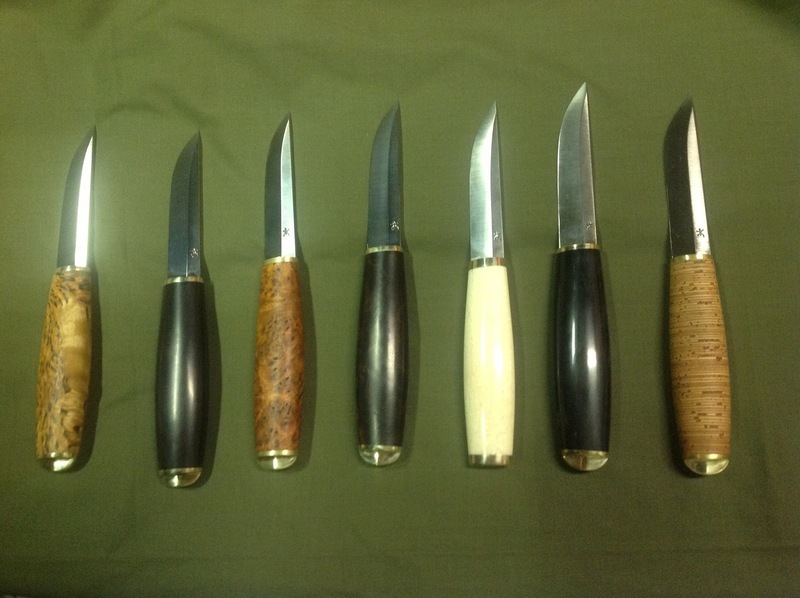 All those wonderful puukko all in one place. It was a small show, but a good one. I bought a beautiful Saami style puukko from Passi Jokanaho, a picture of which is on the back of the 2011 Fiskars brochure. I also met Kay Vikström, who gave me a great little lesson on how to do the “small stitches”, used on the Swedish style sheath. After this experience I was determined to come back and see more puukko and look into the possibility of study, some how, some way. The Summer of 2008 found me at the Kauhava Puukko Festival, where I had come with the goal of trying to figure out if there was some way to study puukko in Finland, whether that meant attending an art school and pursuing puukko on the side, or finding an apprenticeship, or maybe there was something like a folk school I could attend. I didn’t know what the possibilities were, but I figured that Kauhava was a good place to find out. When I got to Helsinki, my cousin called the show organizer, Tina Hauta, to see if she might be able to help me get oriented and be a contact. I’m glad she did, because I would have never thought of it. I would have thought that she would be much too busy to be able to take the time to deal with this foreigner and that I would just figure it out on my own. I wasn’t used to the fact that the smaller scale of things in Finland makes things much more personable than in the U.S. Tina was such a huge help, and a fantastic lady. Not only did she set me up with a room at the Y, pick me up from the train station and show me around town, she set up a visit with Altti Kankaanpää who is the last of the true cottage industry Kauhava puukkoseppä. 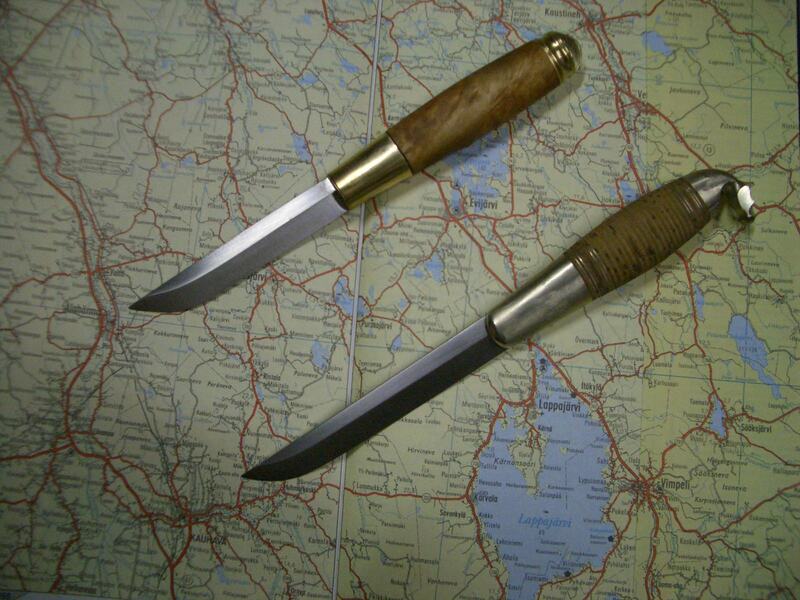 What a great way to be taken in and introduced to the puukko community of Finland. That show was incredible and it seemed like I met everyone in the puukko world. (Little did I realize how many other smiths are out there working who don’t show their work at the three shows and are making beautiful puukko) People were so friendly and eager to meet. I was really amazed that being here from the States was such a novelty, I somehow expected that more Americans would have been out to see the show. Lester Ristinen is of course a well known figure here, but I was surprised how novel it was to see an American so deep in the heart of puukko country! It was at this show that I was to meet Taisto Kuortti, a founding member of the Finnish Puukko Society, and traveling puukko teacher. Although our ability to communicate was quite broken, we were able to connect enough dots to ascertain that I have an uncle who lives in Luumäki and that he was teaching a class in near by Lapeenranta that October if I wanted to attend. I signed up immediately, forget the fact that I had no idea what a Toijalan Puukko was! Kay Vikström was also at this show and I reconnected with him, asking if he was up for a shop visit after the show. (I had left a window of time open after the show hoping that I could hook up a visit or two or some other puukko opportunity) He very generously offered to take me in for a week or so and show me around his neck of the woods. Kay is a great personality and a fun guy to hang around with. More artist than just being focused on knives, Kay is primarily an artist/blacksmith and involved with the music scene, having been a drummer and guitar maker as well. (this is actually something I’ve found to be true of most knife people, here and in the States. Knife making is often just one of many of our creative expressions, I have found that many have other skills and interests that are as or more fully developed, and that the knife making is only one aspect of their artistic expression) I had a great time with him visiting the coast, his summer cabin, a really cool museum on arctic exploration, and a visit to Rauno Vainionpää’s shop, where he showed me how to carve a fan winged bird, and gave me some tips on how to use tuohi or birch bark for handles. Getting permits was not easy. If I was coming as a regular student through an institution it would have been easy, but I was not. If I was coming as an apprentice who was being paid for my work, well, again, this was not the situation. So Taisto tried at a local school to set it up like a class through that institution, but as I was not paying a tuition, this didn’t work either. What I ended up doing was to get myself a business license (toiminimi) and came on the pretext of setting up a business on my own resources. I turned in my application and crossed my fingers. It took a long time. A very long time. After nearly a year I finally got my permit for one year in Finland. I would have to renew it each year. On Halloween, 2010, I set off for Finland. I arrived in Finland on November first, 01/11/10. It started snowing soon after and by the time I made it up to my new digs in Jämsänkoski it was a white winter and I was immersed in this new world. We jumped right in, and I made a few Tommi (well, sort of), then some leuku (Stuorra-Niibi) then a few small Saami knives (Una-Niibas). 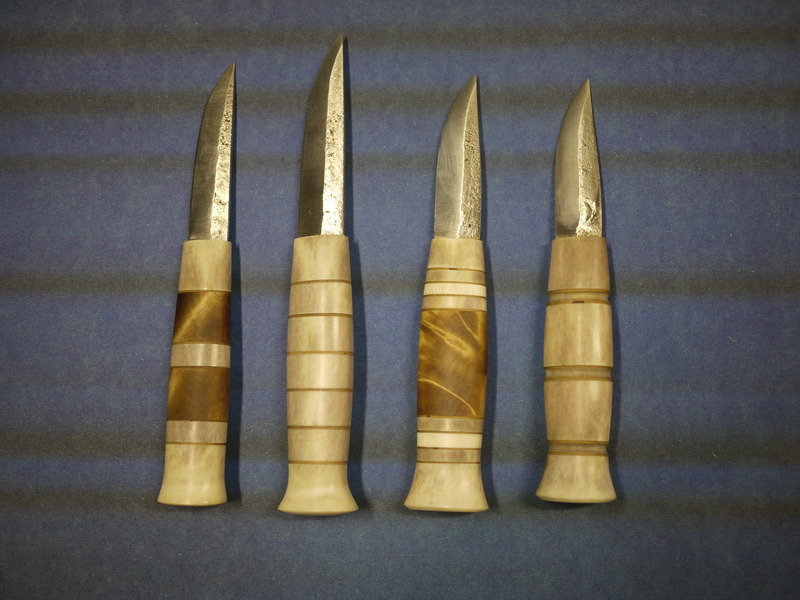 The plan was to make pretty much a few of each model, get a taste of each, then have a sort of small museum that I would be able to take around to exhibit in the U.S. and help to familiarize people with the span of puukko models. But by that summer things had already started to change. 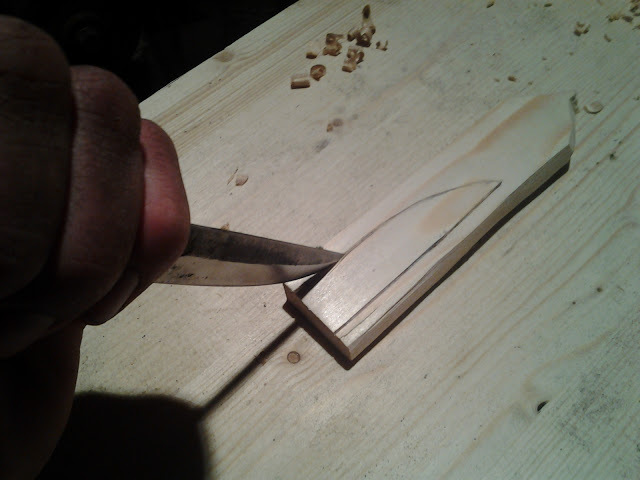 I was still struggling with the fact that the classic puukko models were all straight! Not a single one of them had the curves that I had associated with them, the curves that have evolved in more modern puukko and especially with the contemporary influence of Swedish and Danish knives, not to mention the pull of trying to appeal to the market in the U.S.
By that summer I had begun work on a Kauhava Puukko. 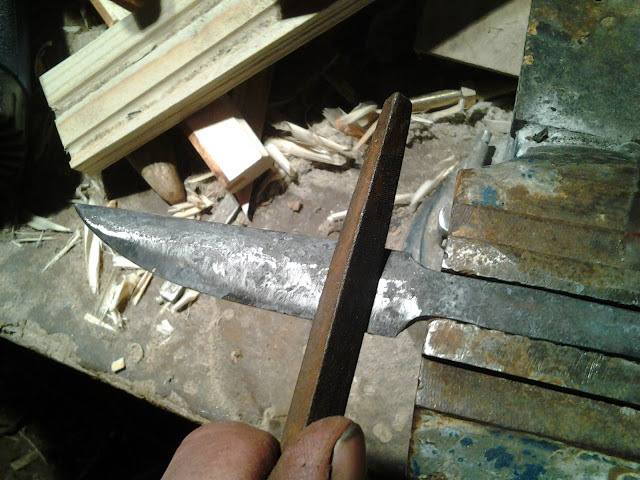 I had decided to start with the Hevosenpää because I knew that the asymmetrical pommel would give me perhaps a little more leeway if I didn’t get the tang in just the right place. (something that is much more telling on a straight handle!) 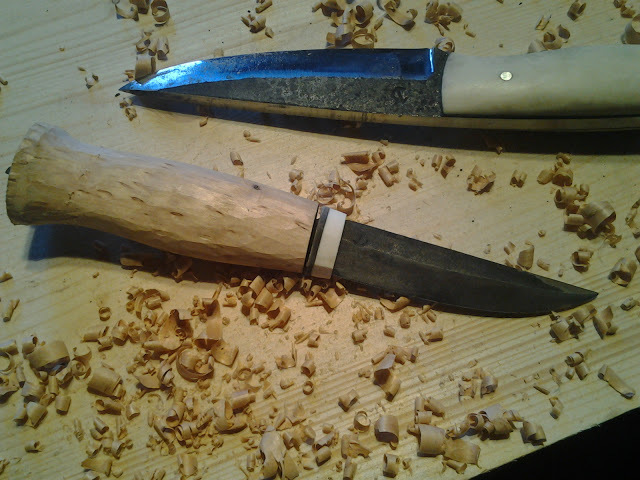 It was at this time that I was to work with someone who would really transform the way I worked and saw the lines of the puukko and even changed my goals and what I wanted to learn while here in Finland. 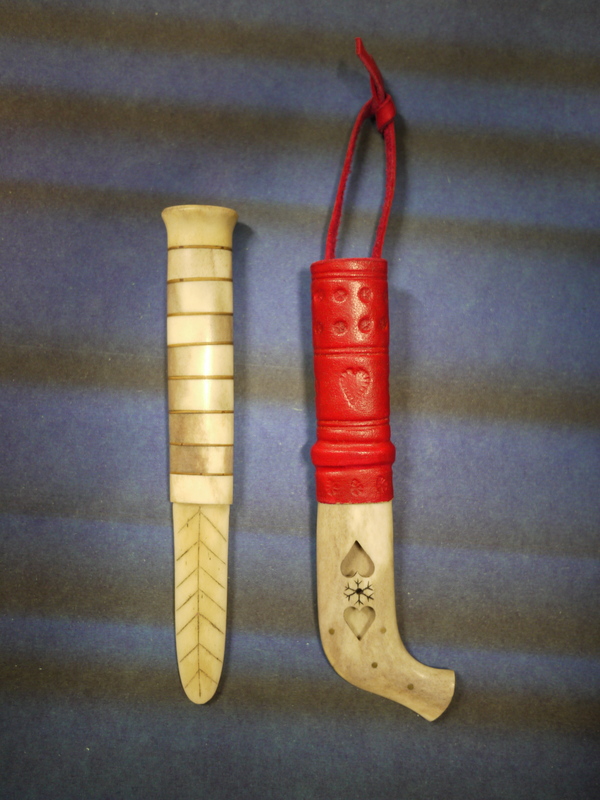 I was just at the point of trying to discern what the differences were between the Rautalampi, besides the tuppi (sheath), and the Kauhava (one of the Kauhava models looks a lot like the Rautalampi in profile) that I went to work with Jukka Hankala. Now, I won’t say too much because his reputation precedes him, so there is little that needs to be said. If you’re not familiar with his work, do yourself a favor and look him up. I can tell you, his work is masterful, not only in craftsmanship, but his eye for design. He certainly gives credence to the adage that “less is more”. One look at his work and you just know that it’s “right”. His execution is flawless. 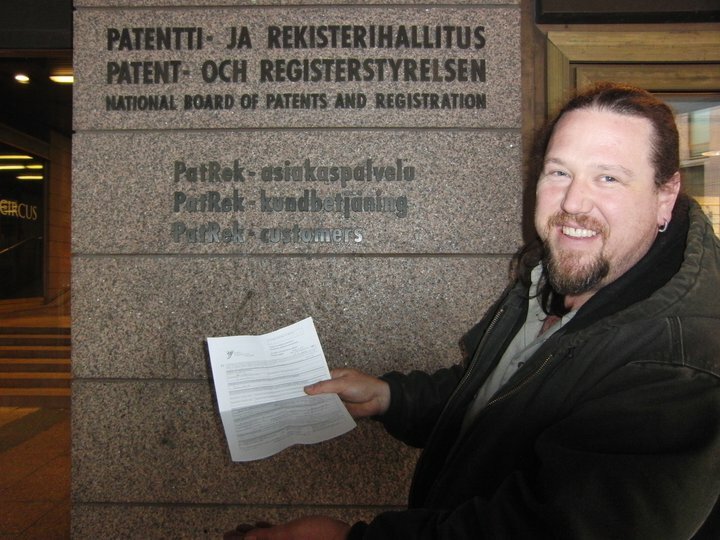 So, I have to admit, it was a bit daunting, the idea of having my work scrutinized by Jukka. It still is! But he’s been pretty gentle on me! In all honesty, I can say he’s truly changed the whole way I work. I feel like I see knives in a whole new light. He’s kind of raised the bar in what I see and what I expect and given me a whole new set of (fun!) challenges. 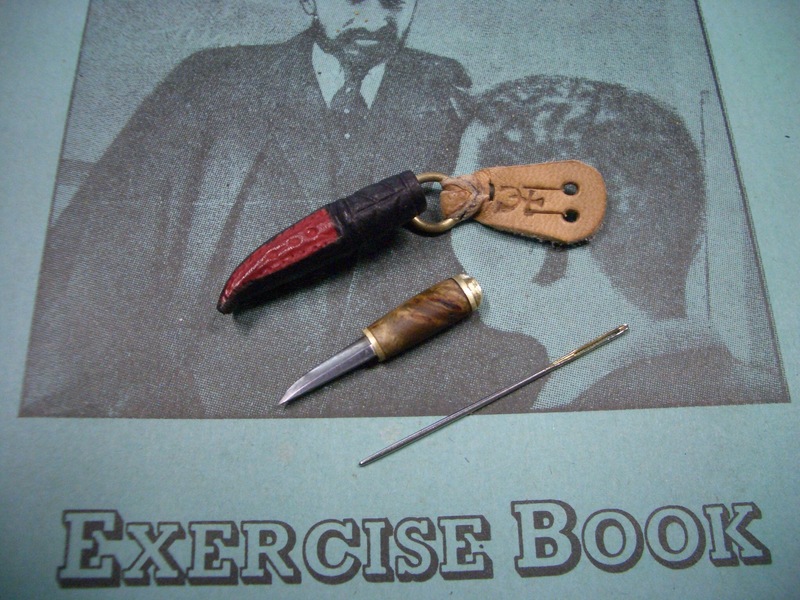 I used to think that the puukko was sort of a rough, woodsy work tool, which it can be. But many of the models are very refined, and there are definitely rules to the aesthetic that connoisseurs look for. Of course, there’s debate and personal preference, but there’s a lot of subtle things going on in those curves and people who really love and study a certain model know their stuff. They will probably be able to pick up a model and tell you how wide and how thick it is without measuring and be able to tell you things like if the pommel is the right balance, blade too long or short or pointy, bolster too long, etc. 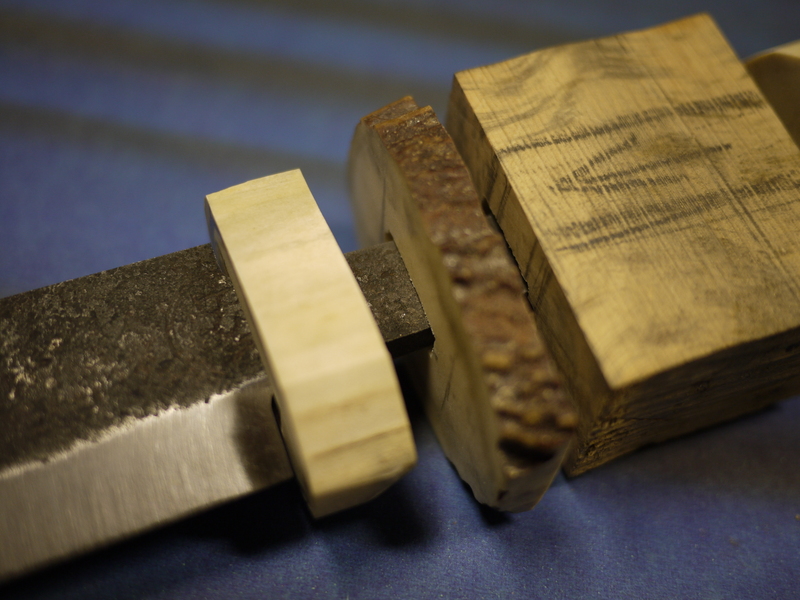 All of this, along with alignment, fitting the tuppi… Not to mention the quality of the forging and heat treatment, everything needs to come together smoothly and gracefully to make a well balanced and beautiful puukko. When you’re working with certain fixed parameters, such as the size and taper of the ferrule (hela) and the diameter of the pommel (nuppi), then the shape of the blade and tang placement become critical. This is the case with the Rautalampi. So, I began work on my first Rautalampi under Jukka. It was tough. I struggled. I wouldn’t say I succeeded completely, but it was enough that I was pretty encouraged. But I was bit by the bug. I had really admired the beauty of that model, but now it was love. A quest. At the same time, I went back and revisited the Tommi. 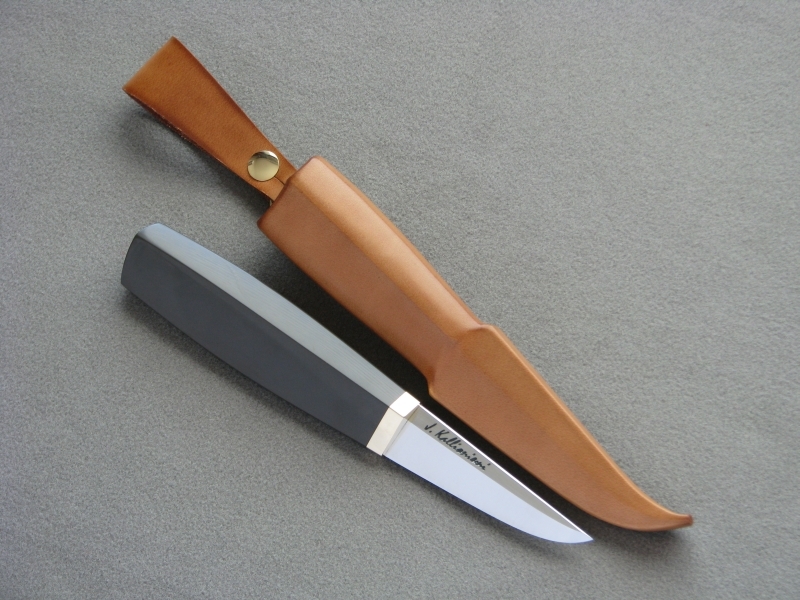 This model is kind of the grandfather of what people think of as the basic puukko, a symmetrical handle, straight blade, sheet stock bolster instead of a ferrule. 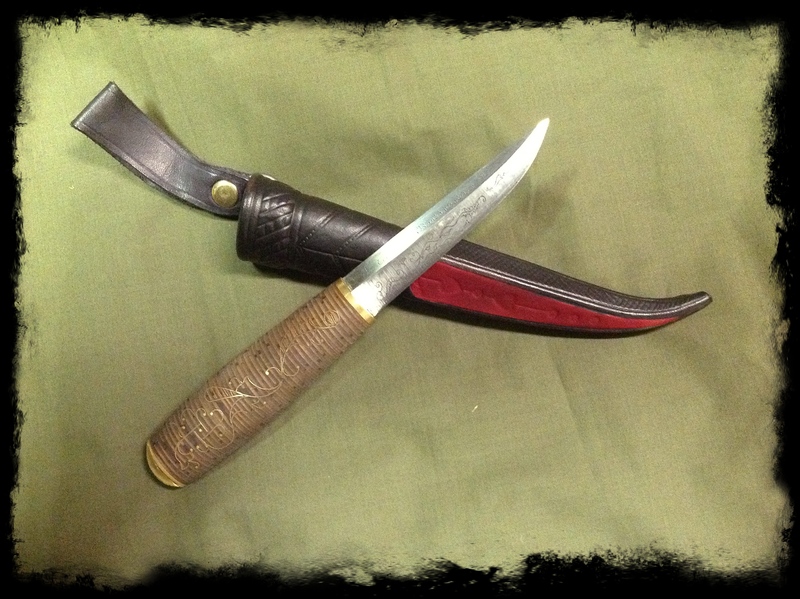 What stands out the most is the ridge on the pommel and the black and red sheath. Actually, this knife also has quite a list of details that are poured over by connoisseurs, but most of this would be missed by the majority of us Yankee’s! But again, under Jukka’s careful eye, we went over and over the model, while I asked him a million questions. He was very patient and he really helped me to see. At that point my understanding of both these knives started to grow. After this experience I realized that trying to understand all the different models of puukko was more than one lifetime’s work. It would be better to really understand just a couple models than to try to understand them all superficially. Since that time I’ve focused mainly on those two models, the Tommi and the Rautalampi. 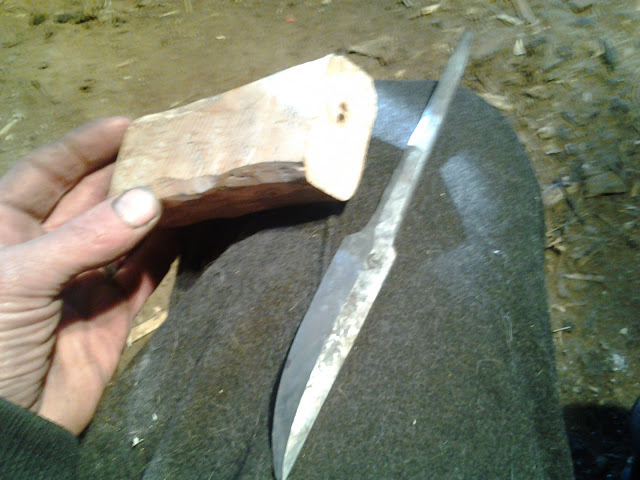 I have done some work on other models as well, experimenting with my own ideas, making crude “country knives” for fun. 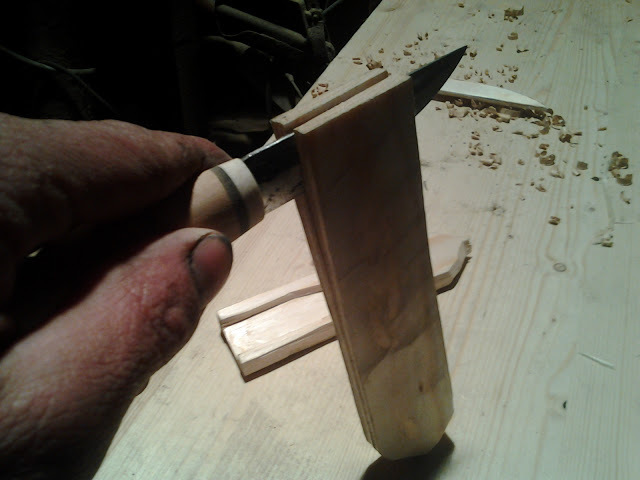 I did try my hand at the Härmä Puukko. Actually, one of the cool things that happened my first summer here was watching Taisto and Toppi make the prop knives for the movie Härmä. There’s even a little of my elbow grease on a couple of those knives! 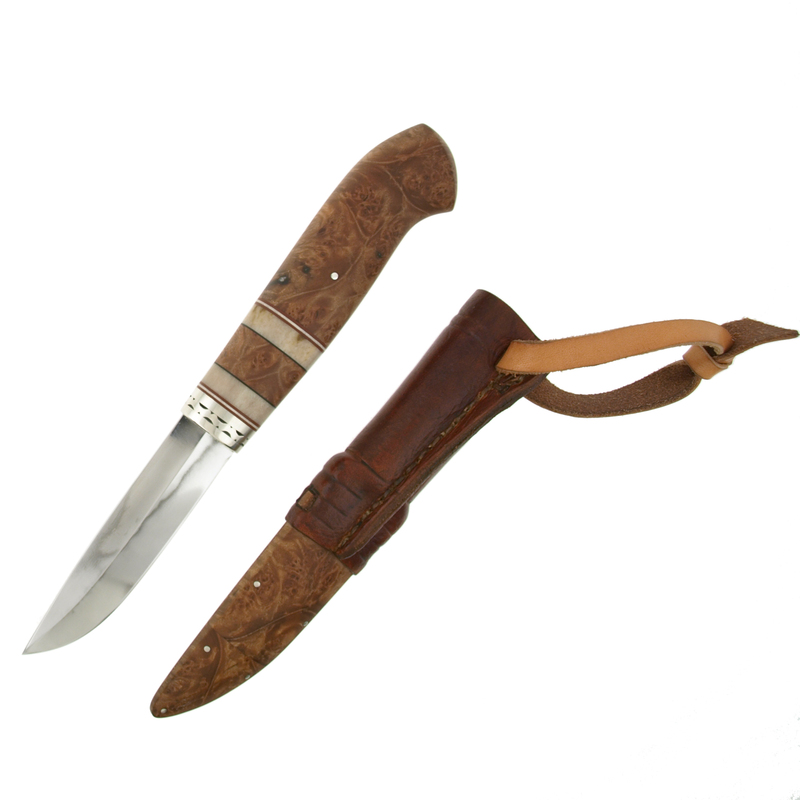 The Härmä is another traditional knife, very old model, that is part of that regions dress and has very specific aesthetics. During this time I’ve also made knives for clients here and in the U.S. Puukko, also a lot of kitchen knives, something I really enjoy. So most of my learning has been with Jukka. I’ll work with him for three or four weeks, go back to Jämsänkoski and work on what I’ve learned, fill any orders I’ve gotten, make some new things for the next show, go back to Jukka’s and get some feedback, make a few new knives, then back to Jämsänkoski. 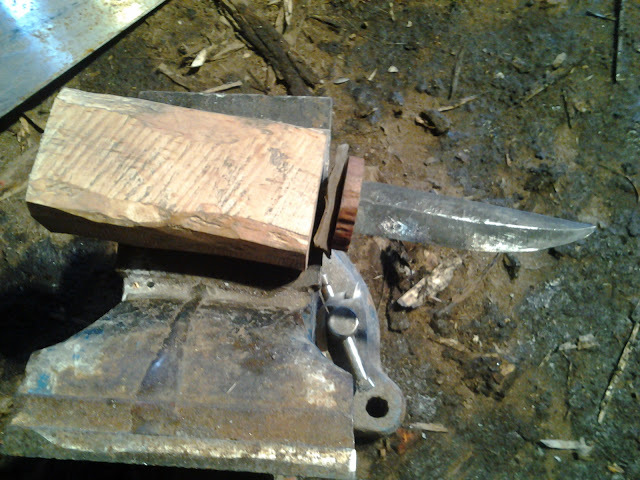 One trip out to Jukka’s, he showed me his method of making a liner lock folder. 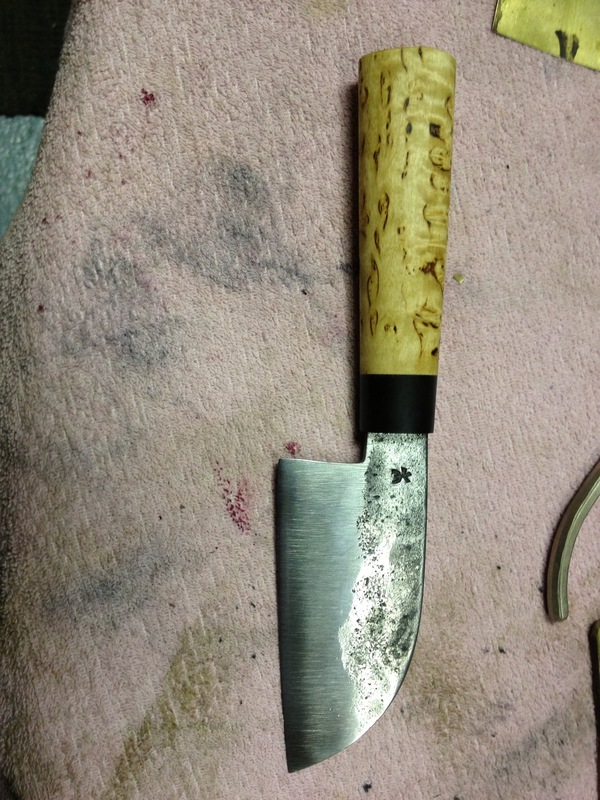 This was my first, even after having worked as a handle shaper at William Henry for eight years! I also had the great experience of working with Jari and Arto Liukko just recently. They scrutinized some of my Rautalampi and gave me all kinds of tips and advice on how to tweak the design and improve on what I’ve got started. It’s so hard when I’ve only seen just a few examples, and mostly in books, so having people who have studied and worked for years on this model is invaluable. 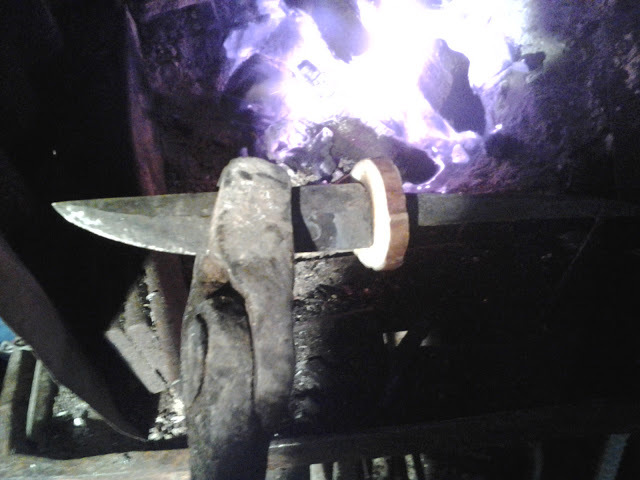 We then went through the process of making a tuppi, hand carving the lesta (insert) with a puukko and making a metal tip (karki hela) and throat (suuhela). This is all very hands on work and very exacting. All these techniques could be done in an 1800’s shop. Once again, the challenge is on, the bar has been raised.